In March of 2019, the Journal of Cleaner Production published a study that reveals the barriers to brownfields redevelopment in Pakistan. Remediating and revitalizing the nation’s vast inventory of environmentally-degraded urban sites could help the country meet its UN sustainable development goals (SDG); specifically the ones related to poverty alleviation, sustainable cities, health and access to water and sanitation. According to the UN Environment Programme (UNEP), brownfields redevelopment is one of the top 21 issues that must be addressed in order to meet the challenges of the 21st century. Such sites include heavy manufacturing sites, abandoned railroads and railyards, and chemical storage facilities. Jawed Ali Khan, the Islamabad-based program manager in for UN-Habitat’s Sustainable Human Settlements Programme, says the country is expected to largely shift from majority rural to majority urban within 20 years, due to urbanization that’s currently taking place at about 3% annually. “Reclaiming environmentally degraded, contaminated and abandoned land sites through brownfield redevelopment strategy to accommodate the growing urban population with sustained provision of basic amenities is a viable strategy,” he explains. The report found that brownfield redevelopment barriers include 1) absence of law and regulation, 2) unsustainable government policies, 3) lack of policy incentives, technical personnel, funds and repair technology, 4) waste disposal problems, 5) insufficient site studies, 6) paucity of lessons learned from other countries, and 7) insufficient environmental information. “Though it is a first brownfield redevelopment study on any developing country, the findings have a viable scope for any other developing country to achieve urban sustainability, particularly in South Asia and Asia-Pacific regions marked by unsustainable urbanisation,” says the study’s co-author, Yuming Zhu, professor at the Northwestern Polytechnical University’s School of Management. Due to the scarcity of land for urban development, Brownfield Redevelopment (BR) is considered a sustainable urban land tool in developed countries, but its adoption in developing countries remains in its infancy. Barriers impeding BR need to be investigated in detail. However, few studies have analyzed barriers to BR in developing countries. This study aims to analyze the critical barriers to BR in Pakistan by using a two-stage methodology including the Fuzzy Delphi Method (FDM) and Structural Equation Modeling (SEM). Initially, 41 barriers were identified through a comprehensive literature review. FDM screened out 33 barriers through expert opinion. Survey questionnaires were sent to major stakeholders involved in the BR process. Finally, valid responses were analyzed using SEM to verify and rank the most critical barriers. Study results indicated 26 critical barriers. The top five critical barriers were lack of policy incentives, the complexity of public-private partnerships, lack of professional and technical personnel, the conflict between stakeholders, and lack of awareness of environmental law. A comparative analysis of barriers to BR in Pakistan and other countries including the USA, Canada, the UK, Germany, and China showed that critical barriers vary by country. Furthermore, factor analysis results extracted five major categories for 26 critical barriers, including political and legal barriers, financial and economic barriers, technical and operational barriers, management system barriers, and environmental barriers. The most dominant barrier category was technical and operational barriers, impeding BR in Pakistan. This study creates value in the BR literature by identifying the most critical barriers to BR in a developing country. It could support practitioners and land use policy makers in developing appropriate strategies to promote BR. 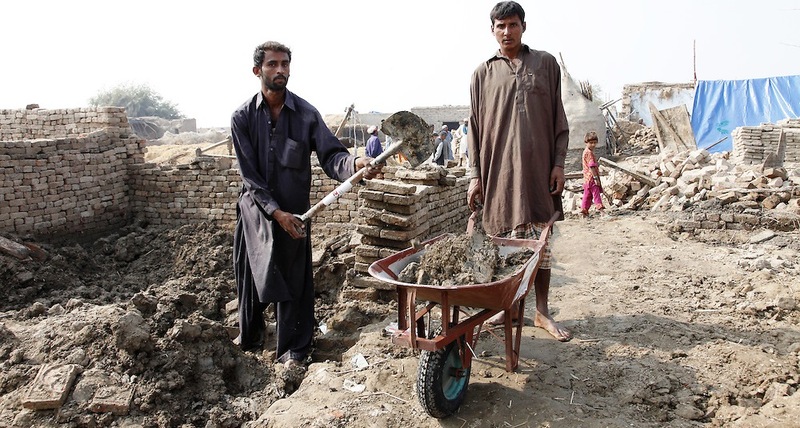 Photo of flood recovery work in Pakistan courtesy of Russell Watkins / Department for International Development (DFID). See SciDevNet article by Saleem Shaikh.